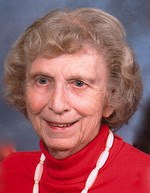 Ruth C. Snyder, 88, of 337 Grace Village Drive, Winona Lake, Indiana, was “loosed away upward” on Tuesday, March 10, 2009, at 4:50 p.m. in her residence at Grace Village Retirement Community of Winona Lake. Ruth was born October 20, 1920, in Philadelphia, Pennsylvania, to Charles Croker and Marion (Shepherd) Croker. As a young person Ruth felt called of the Lord to serve as a missionary in Africa. She prepared for missionary service by attending Philadelphia School of the Bible, graduating in 1944. Then she entered Grace Theological Seminary, graduating in 1947 with the Christian Education Course. August 9, 1947, she was married to Reverend Roy B. Snyder in Philadelphia, PA. Then, along with her husband, she went on to complete her studies in theology, with both graduating in 1949. In the fall of 1949, the Snyders left for Paris, where they had ten months of French language study. In July 1950 they continued on to French Equatorial Africa, in the province of Oubangui Chari. The first term was very difficult as Ruth had to travel 500 miles each way for surgery at the Presbyterian Hospital in Cameroon. Ruth went there twice for surgery, ten weeks each time. Her ministry in Africa was teaching women and girls at a mission station 185 miles north of the capital city where the Snyders lived for 15 years. The last 20 years were in the capital city of Bangui. There Ruth worked with the leaders in women’s and girl’s work. She also operated the Missionary Guest House for 18 years in Bangui. The Snyders retired from Africa in 1984, after a total of 35 years of missionary service. During her retirement years, Ruth was active with the women’s missionary organization, Women of Grace. From 1985-1990, she was the National Prayer Chairman. She followed this by staying active with different prayer groups such as the Way Home Prayer Group and the Global Prayer Group at Winona Lake (IN) Grace Brethren Church. She will be lovingly remembered by her husband of 61 years: Reverend Roy B. Snyder (Winona Lake, Indiana); Brother: Wayne (wife Dorothy) Croker (Big Piney, Wyoming); and two nephews and three nieces: Bob (Custer, Washington); Pat (Cheyenne, Wyoming); Kathy (Big Piney, Wyoming); Coke (Sheridan, Wyoming); Michael (Missoula, Montana). Ruth was preceded in death by her parents. Visitation will be on Friday, March 13, 2009, from 6-8 p.m. at Redpath-Fruth Funeral Home, Warsaw, Indiana, and on Saturday, from 12-12:30 p.m. prior to the service at the church. Her funeral service will be Saturday, March 14, 2009, at 12:30 p.m. at Winona Lake Grace Brethren Church, 1200 Kings Highway, Winona Lake, Indiana, with Pastor Charles Ashman officiating. Burial will be at Oakwood Cemetery of Warsaw, Indiana. Memorial contributions may be made to Grace Brethren International Missions, P.O. Box 588, Winona Lake, Indiana 46590 for the construction of the Brethren Biblical Seminary in Bangui.